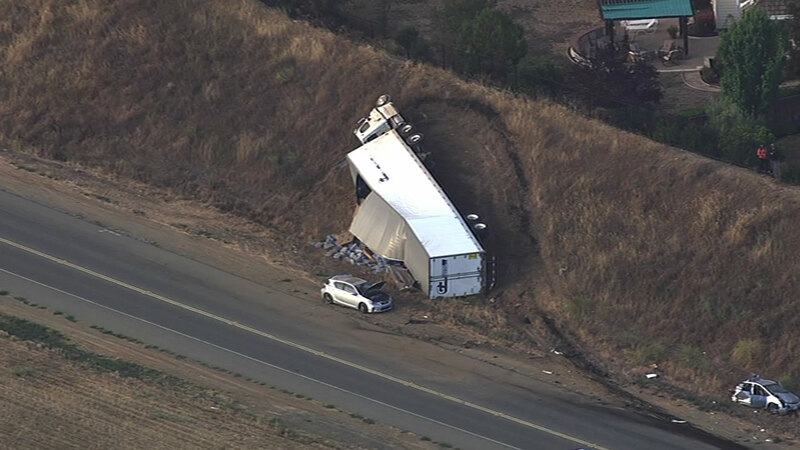 LIVERMORE, Calif. (KGO) -- A man was killed and three other people were hospitalized after a big rig crashed into three cars on state Highway 84 in Livermore early Wednesday morning. The crash was reported at 4:46 a.m. between Vineyard Avenue and Vallecitos Road, a key connector between I-580 and I-680. Police say the big rig driver crashed into the three cars from behind. "Early indications are that traffic was slowing and it kind of came up on him fast and he wasn't able to slow in time," Livermore Police Department Sgt. Steve Goard said. A man in one of the cars was pronounced dead at the scene, while the big rig driver and two other people were taken to the hospital as a precaution because of complaints of pain, Goard said. Officials shut down the highway in both directions so they could safely investigate and clean up. The truck landed on an embankment and spilled it's load of bottled water. "It is unsafe to get personnel to the vehicle to inspect it so have to wait for heavy equipment to lift it up and make it safe so we don't have to worry about it tipping any further," an official said. The highway is expected to be closed in both directions until 8 p.m. while authorities investigate the crash. Police are advising motorists to seek an alternate route, such as Arroyo Road, around the scene of the crash.